631,238,400 seconds. 10,520,640 minutes. 175,344 hours. 7306 days. 1043 weeks. 20 years. 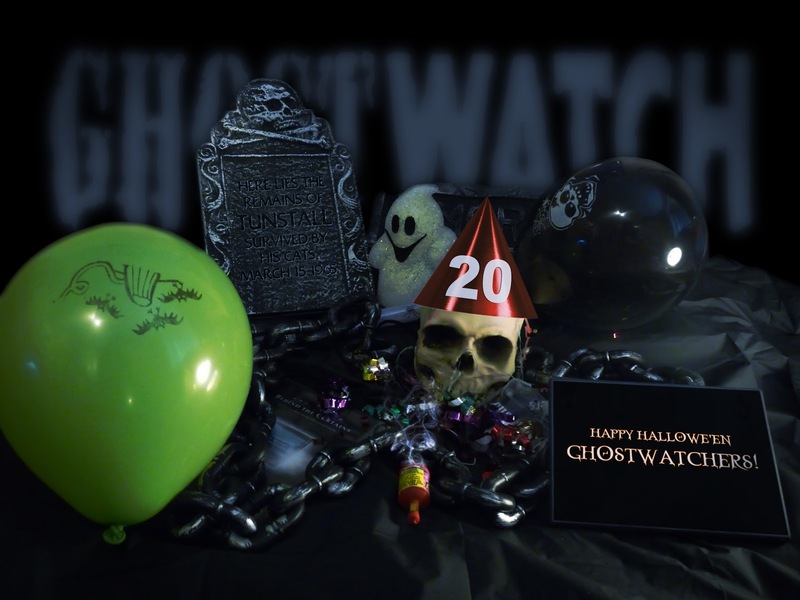 Happy Hallowe'en, Ghostwatchers - and also, Happy Twentieth Anniversary to Ghostwatch! To mark this momentous occasion (and also National Séance 2012 which kicks off at 9:25pm tonight), our new Gloryhole page has been updated with practically EVERY Ghostwatch Story ever sent in to the BtC project - from our humble beginnings on YouTube around 2007(ish), onward. Many thanks as always to everyone who sent in a message! Ghostwatch Stories are one of the defining aspects of the show's legacy and have helped keep the old 'Hallowe'en Hoax' firmly in the public consciousness now for *just* over two decades. At some point, most of us have felt compelled to share our experiences (or even make a film!) concerning the show, and when combined, I think you'll agree, they make for some pretty fascinating reading. We've really enjoyed checking them out and hope to see many more in years to come. Looking forward to seeing you all at NS12 later on! Quick update re: the doc - work is still ongoing, and all things permitting, it shouldn't be too long before we're completely, wholly, totally locked and ready for release sometime later this year. We had a truly phenomenal response following the premiere of our new trailer on SFX.co.uk - with lots of new followers and messages coming in thick and fast. Thanks again to everyone for all the kind words and re-tweets. Intriguingly, for some reason, more than a few Tweeters seem to be under the impression that the doc is a BBC production and is set for imminent release on BBC Four(!) Just to set the record straight, the doc has been solely produced by Lawman Productions (Rich Lawden and Ghostwatch director, Lesley Manning's production company) and currently, there is no word on any potential broadcast date (at least, for the near future). Should any news come through on that front, we'll be sure to update the blog, as per usual. I cannot believe it is twenty years ago since I settled down as a fan of Craig Charles to watch him in a drama about a ghost hunt and ended up 90 minutes later with my back against the wall so that "Pipes" couldnt creep up on me from behind. It still scares me now and I am 37! Oh, hang on... we're on!